10,000 houses are still without power in Bundaberg as Ergon Energy reconnects electricity. More than 200 linesmen have been called into the region. In the past hour 2800 customers in South Bundaberg, Walkervale, Avenell Heights and Norville have had their supply restored. 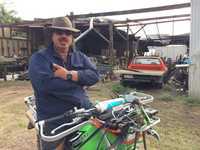 Ergon Energy spokesman Rod Rehbein said that, with so many crews in the field, Ergon was not giving any particular area priority based on location. "We are working to get power back on to the North Bundaberg water towers, which is in line with our standard approach after major events to prioritise key community infrastructure," Mr Rehbein said. 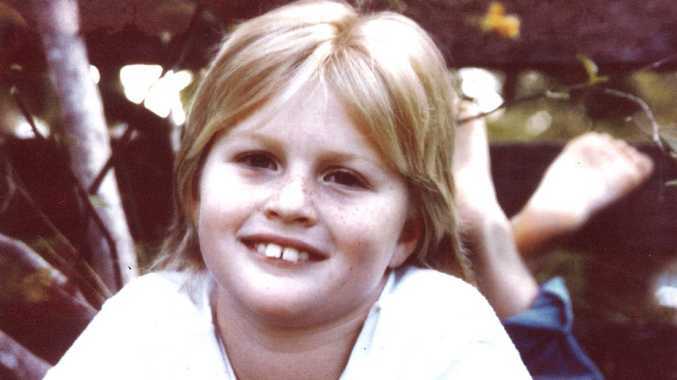 "Likewise, we will attempt to provide power to schools where possible and also the Bundaberg CBD and Hinkler Central due to their community role. Hinkler Central is back on now. "Otherwise, our aim is to get as many customers back on as quickly as possible, so this means we balance the time required to carry out repairs on a section of the network against the number of customers who will be restored as a result of that work." Mr Rehbein said that meant they also prioritised restoring high-voltage feeder lines and may isolate some smaller sections or individual service lines to get power on to the bulk of customers more quickly. 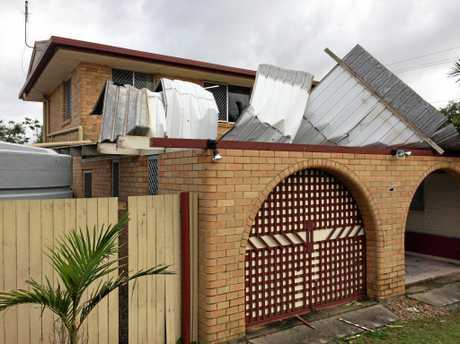 He said this was done at Bargara, where 17 customers lost power to allow repairs (they have now been reconnected) and at Alloway, where a handful of customers remain without power. Ergon Energy said it had scoped most of the work required and is expected to restore power to most customers by tonight. Bundaberg Police said a fault had caused all rail boom gates to close across Bundaberg. Technicians are working to resolve the issue but in the meantime if you are crossing town be patient and try the Ring Rd, Burrum St tunnel or via North Bundaberg. Traffic lights are continuing to cause chaos on the region's roads. Police advise drivers to obey the normal road rules when approaching an intersection that is normally controlled by lights. Hinkler Central remains closed along with The Waves and the IWC. THE severe storm which brought it's fury down on Bundaberg yesterday may have only last about 20 minutes, but it sure packed a punch. 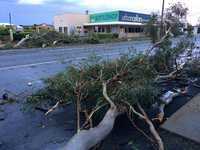 Bureau of Meteorology spokesman David Croc said the highest unofficial wind gusts recorded exceeded 150km/h when the storm hit Bundaberg before 5pm. 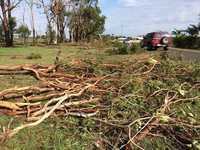 "The highest official wind gust was 98km/h at Bundaberg Airport but there were much higher wind gusts than that," he said. "One of the storm spotters recorded gusts of over 150km/h." Car is rescued from beneath a tree : Council crews and residents work to retrieve a car stuck beneath a tree after a wild storm lashed the region. Mr Croc said the storm moved fast and furiously because of the "steering winds" inside of it. "The storm was moving quite fast, which is to do with the steering winds," he said. "With a storm as severe as what that was, it tends to feed off it's own energy and can propagate quite quickly." Mr Croc said there could be a chance of another storm today, but it would not be anywhere near as severe as yesterday. And while the wild weather may have passed, the clean up has only just begun for some residents. 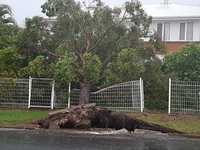 Moore Park took a hammering as did suburbs in central Bundaberg. NewsMail Editor Craig Warhurst was in Curtis St this morning and said the damage was severe. 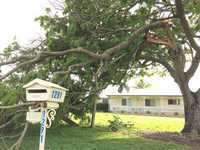 "There is a lot of trees down in the yard and one tree has been struck by lightning," he said. "Trees have fallen on houses and taken out power lines. 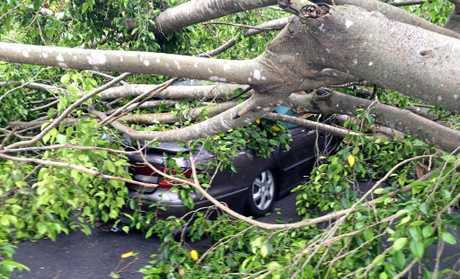 "Another tree has fallen over and landed on a car." Mr Warhurst said residents in Hunter St also took a major hit, with some houses losing their roofs. 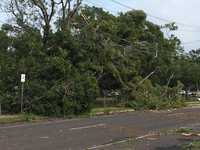 Bundaberg South State School is said to be closed after trees have fallen onto power lines. Ergon Energy is urging residents to steer clear of the many fallen lines around the region. "There is a lot of concern that some people are being rather foolish around electricity. We have had reports on FE Walker St that someone has moved a fallen line," spokesman Rod Rehbein said. "Further along Walker St a whole line was across the road and someone has moved it thinking they were doing the right thing. "Think about it, it is just not worth it." Mr Rehbein said more than 27,000 houses lost power yesterday with about 15,000 customers still yet to be connected. "We will have close to 200 guys in the field today doing their best to get power up and running as quickly as possible," he said. 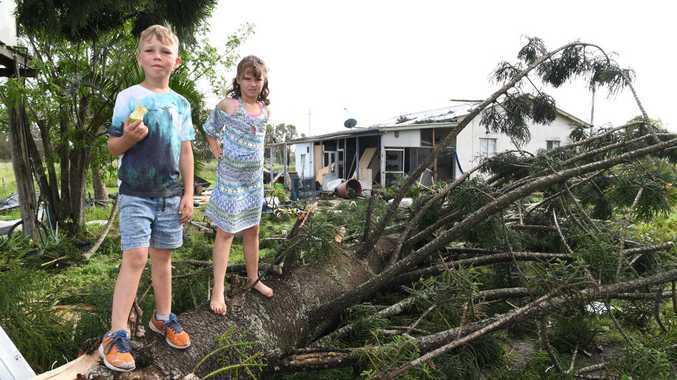 Kids relive storm : Two Bundaberg children talk about the moment the storm hit their home. Free waste facilities Mayor Jack Dempsey has announced that all Bundaberg Region waste facilities will be open this morning to accept all waste free of charge until close of business on Sunday. 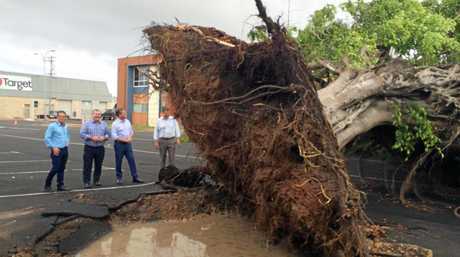 The Mayor has been inspecting the Bundaberg area since first light and said yesterday's storm had caused significant damage to infrastructure, homes, and vehicles as well as bringing down a massive number of trees. 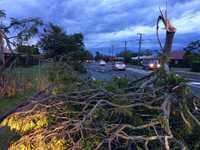 The Mayor said many homes were still without power and Ergon crews were working to restore power. He urged people to be careful, to be patient and to be aware that this event was an indication of what can be unleashed during storm season. He said roads were impacted by trees and debris and he pleaded with motorists to drive to the conditions. The Mayor extended his thanks to SES, Ergon and Council emergency crews who have been tasked with restoring normality.